More people are visiting church websites than ever before. Some have moved to a different community and are looking for a new place of worship – others are looking to change venues. There are people looking for friendship – some are young people seeking a new direction in life. Whatever the reason, their first reaction to your site’s homepage is crucial – make a great first impression. Your landing page must look professional, modern and inviting. What do you want to communicate? Are you open-minded? Is it fun to attend your services? Do you answer questions? Make what you want to convey very clear on your homepage – don’t let visitors leave wondering what your church represents. Compel people to get involved with your church. Give them a reason. Your homepage should have all the information that people are initially looking for. Make sure it’s easy to find service and event times and their locations. People don’t want to read outdated information – have all your dates and times current. Make sure updating information is easy to do for yourself and other staff members. Prominently display a phone number, email address, and your church’s physical location. Make it easy for people to contact you – be accessible. Make sure your answering service delivers a friendly message and respond to phone messages and emails promptly. The name used for your site should be easy to remember. Design a memorable logo that everyone will identify with over time. Some of your readers, especially the elderly, will have poor eyesight. Make it easy for them to read your content by using a clear, easy-to-read, large type font. Show your church at its best. Photos of smiling congregation members enjoying themselves, children and elderly folks laughing – make your church look inviting and fun. If your congregation doesn’t have a photographer willing to donate a few hours for photo shoots, consider hiring a pro so your website looks great. Including a personal video is an excellent way of introducing yourself. Include a few videos of fun activities as well, such as church suppers, sing-a-longs, and picnics. Record your sermons so that everyone who can’t attend can enjoy them. You should include other pages on your site, such as an “About” page. Who are you? What does your church do? A short bio of staff members along with nice photos will make your parish look approachable. Include a short history of the church. Other pages can include “Contact”, “Blog” and “Sermons”. Keep site navigation simple and intuitive – many websites try to be too elaborate, resulting in confusion for the visitor. If you are considering hiring a company to help you, ensure they will work closely with you to produce exactly what you want. Once you have your site up and running, you will need content. Blog posts are a great way to keep in contact with your audience. Post regularly – once a week is a good schedule to aim for. You can include next week’s sermon and agenda, the time and place of each service, upcoming events and suppers, and general announcements. Keep the format the same in every post – over time, people will appreciate knowing just where to find what interests them the most. Include a “frequently asked questions” page – everyone loves the FAQ page. This is where you show your stuff by responding to questions intelligently and thoughtfully. Answer all questions, no matter how trivial they may seem. This may prove to be the most difficult part of managing your site, but it can also be the most rewarding. Closely related to the FAQ section is the “Comment” area. Including a comment section at the end of each blog post is an excellent way to engage people. You will want to approve each comment manually – you don’t want inappropriate comments randomly appearing! Install an automatic filter to catch most spam comments to make your job easier. Approve comments quickly – the commenter will be waiting to see their thoughts in type. Respond to each comment with a thoughtful remark. Encourage comments by asking a question at the end of each post. Email is a great way to let your readers know when you publish a new blog post. Automated newsletters, sent out to your subscribers each time you post a new blog, will keep everyone up to date. Your parish can save money – postage stamps are not necessary for emails and newsletters do not need to be printed. You will need to collect email addresses so you know where to send your newsletters. You can accomplish this in a number of ways, such as making an announcement in church informing the congregation of your newsletters. Ask them for their email addresses if they are interested in receiving your announcements. A sign-up form on each blog post and page on your site will allow visitors to receive your newsletters after registering. Congregation members confined to their homes would especially appreciate staying in touch with their church through the website. Make it easy for them – offer help with obtaining a computer, setting up an internet connection, learning to connect and interact, and typing skills – whatever is necessary. Ensure that your website is mobile responsive. Many people have cell phones they use regularly to browse the web. They won’t stick around long if the pages on your site don’t display properly on their screen. Connect with social media – create accounts with the most popular sites. Develop a Facebook group or page. Encourage “liking” and “sharing” among your readers – make it easy to share your content by including share and like buttons on your website pages and at the end of each blog post. Appeal to a large audience. Include information for young and old, new and established parishioners, Christians and non-Christians. Welcome atheists and agnostics into your fold – they may be looking for answers and help you can provide. Many communities do not have mosques, temples or synagogues – make it clear that other religions and denominations are welcome. Having a website is easy – anyone can do it. Having a good website involves dedication and a lot of hard work. If you have lots of time to dedicate to your site and are willing to learn new skills, this option may be for you. Some people do it themselves and settle for what sometimes results in a mediocre site. 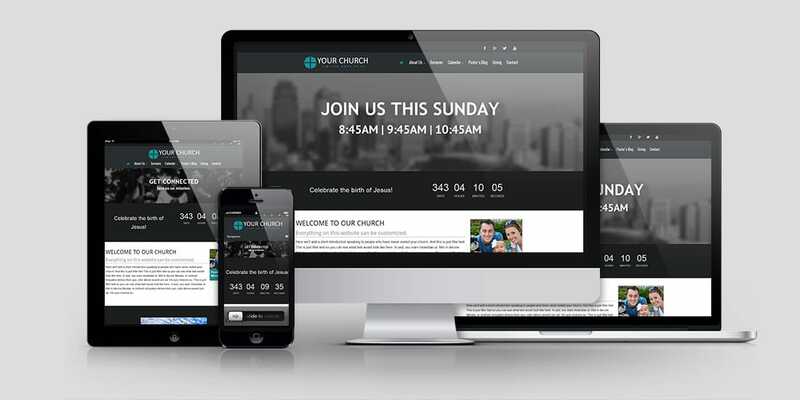 If you don’t have the time or experience necessary, consider obtaining the services of a church website developer. The developer can set up the site, ensure search engine optimization (SEO), take care of site maintenance and updates, create social media accounts – even procure content for your site and help with the FAQ and Comments sections. The internet is growing along with you. An attractive, professional, well-designed and up-to-date web presence is important to this growth. Make a good first impression. Create an online presence that compels visitors to read more than just your homepage – make them want to become involved with your church. Represent yourself well, using photos and videos. Make it easy for people to find and contact you. Respond promptly to comments, questions and emails. Keep in contact through newsletters and blog posts. Connect with social media. Appeal to a large audience – make it clear that your doors are open to everyone. Enjoy your new world-wide-web presence!